How many times have you stood in front of a retail counter or an airline desk, or spent valuable appointment time waiting for your doctor, nurse, attorney, or a service professional – while people looked up information in various software systems? Have you been passed around a company’s telephone system, hoping to find somebody who can help you and can see a transaction history? As customers and clients, most of us know how frustrating it can be when a company’s systems are not integrated and people have a hard time helping you. It doesn’t give comfort to imagine that the same thing happens frequently within the organization, as well. For trading partners and suppliers, poor systems integration can make the difference between a productive engagement based on shared goals and an unsatisfying relationship where you are made to wait, or receive incomplete or outdated information. Engaging with that kind of vendor or trading partner can quickly get expensive and inefficient. Common business tasks can be similarly delayed and unproductive when people need to enter or look up information in multiple systems. It’s very easy to forget something or make an error when you need to overcome hurdles to do your work. When customers or finances are impacted, mistakes can be costly. At an executive level, poor integration often means that decisions are made without consideration of all pertinent facts. When systems are not connected, it becomes easier to forget them if you’re not a habitual user. Certain data stores can then lose much of their insight-enabling and decision-driving value. Over time, these data islands can become vulnerable to theft and fraud. Once people realize their access to data stores is limited, they may request information and reports from IT, taking time away from more critical tasks. You may be able to elevate the customer experience and improve service levels, including access to self-service account, product, and order data for customers. You can enable employees to have a better understanding of company processes and their part in them, which can help them become more accountable and productive. By connecting ERP and PLM systems, you could bring about better collaborations between engineers and production teams and reduce the time between creating a new product or product feature or version and its manufacturing. Feedback and findings from production and procurement could be made available directly to the product engineers, who could then improve their designs. The results of marketing campaigns managed in CRM could reflect directly on the financials, forecasting, and procurement processes handled in ERP. If you generate data from the internet of things (IoT) to improve your control over the quality of goods and storage or production environments, or to improve operations, integration of the data source with analytical and reporting systems is essential, or the value of the information will be extremely limited. Systems integration is not as spectacular as virtual or augmented reality, 3D-printing, or other innovative technologies, but can help you bring about remarkable outcomes. 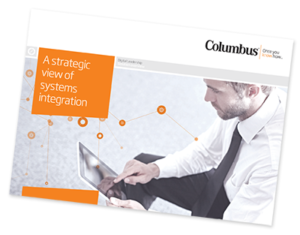 The range of integration tools and tactics – including standard integration, data migration, EDI, and integration in the cloud – is not well known outside of IT. But becoming a little more familiar with it might pay off in terms of more productive employees, faster-moving processes, and happier customers.